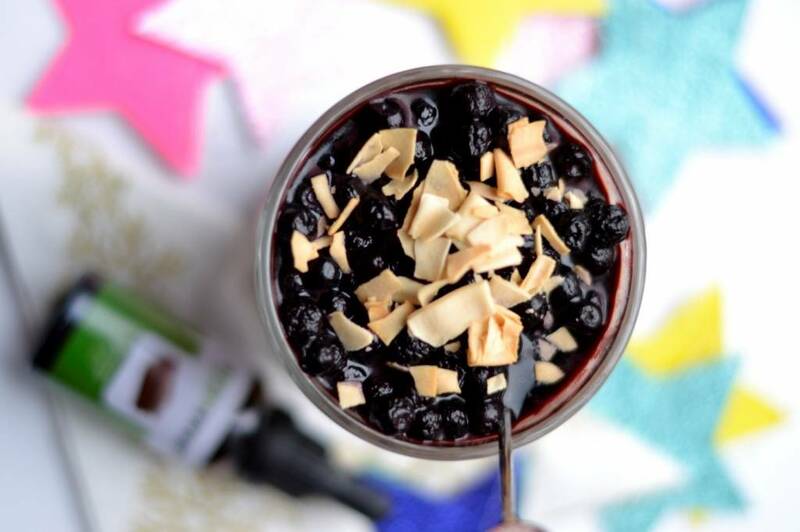 Chocolate chia pudding with wild berries, a recipe from Manon from veganflavours.nl, in which she has used greensweet liquid stevia. and some drops greensweet liquid stevia chocolate to taste. Put the coconut milk together with the coconut oil, almond paste, raw cocoa and maca in the blender. Turn on the blender and add some greensweet liquid stevia drops of chocolate. Pour the smoothie into a glass and add the chia seeds. Stir well. Let stand for 10 minutes. Then stir well again and put the glass in the fridge for 1 night. This makes your pudding stiffer. Remove your pudding from the fridge and finish with eg 2 tablespoons of coconut yoghurt, wild berries and some coconut chips.